SUMMER HOLIDAY SPACES AVAILABLE FROM 7AM TILL 6PM. My name is Nicolette Smit; I am a qualified special needs teacher that holds a pediatric first aid certificate. I have a passion for children and encouraging the development as they grow. Working with children is something I have wanted to do from a very young age and decided to become a teacher, focusing on special needs. I have taught in a range of special needs schools for the last 10 years and in December 2013 I gave birth to my son. I decided to start childminding, so I can look after my own son and help other parents in need of childcare. 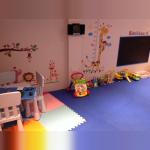 I aim to provide a setting that both children and parents will love and enjoy. I've been a special needs teacher for the last 10 years. Ive also been looking after children in the evenings for 10 years before the birth of my son. I offer flexible opening hours but primarily my setting is open between 7:00am & 6:00pm, if you require care outside of these hours please discuss it with me. Ad-hoc care is offered subject to availability. Im available 5 days a week and 3 school aged spaces. I can do pick ups from either St clements, Ewell grove or Ewell Castle. Pleasr contact me for details on my rates.